Pianist and Composer Alan Simon is known in the jazz world as a "musician's musician"; a skilled, inventive player with an impressive command of both the traditional and modern jazz idioms. Alan Simon first attracted national attention during his years with the Lionel Hampton Orchestra. He recorded and toured extensively with the band, eventually playing all the major jazz festivals in Europe, South America, and the United States. Alan's appearances with Hampton included a date at the Vienna Opera House, and a concert at Carnegie Hall, where Hampton's quartet was backed by a symphony orchestra. During his stint with Hamp, Alan was singled out frequently for praise by the critics. Said a typical review in the Jazz Journal International, covering an appearance at the Grande Parade du Jazz in Nice, France, "Hamp's pianist played lovely, swinging and at times, quite majestic piano and seemed quite undaunted by the varying stylistic requirements of Hamp's repertoire." Or from The Omaha World Herald, "Hampton handed over the spotlight to pianist Alan Simon, who demonstrated that he is no mere sideman. Simon produced one of the hottest, most intricate solos of the evening." Alan has shared the stage with jazz legends Dizzy Gillespie and Buddy Tate. He has also backed up Slide Hampton, Frank Foster, Slam Stewart, George Coleman, Toots Thieleman, Anita O'Day, Panama Francis, Mel Lewis, Major Holley, Howard McGhee, Lee Konitz, and Al Grey. Alan Simon received rave reviews for his first recording under his own name: Rainsplash, a Cadence Jazz Records release. "Simon is a wonderful and consummate piano man," said the Chicago Observer, "...a no-nonsense hard bop blowing date and all parties involved are at their swingin'est." In Jazztimes, Stanley Dance wrote, "His solos swing relatively loosely...a thoroughly professional date by men of whom more is sure to be heard." And from Coda magazine: "This fine working band creates intelligent, inventive, lyrical music." 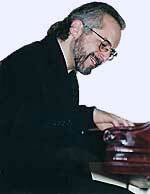 His other albums include The Present - a collection of original compositions, contributions from band members and timeless jazz classics - and Without A Song, recorded live at Music Mountain in Falls Village, Connecticut, about which New York Times writer Claiborne Ray writes that Alan "shows his Tyneresque ability to play percussively without bashing the melody." In the mid-1980s, the Alan Simon trio traveled to Chile on a tour sponsored by the American Embassy. The group performed and taught workshops throughout the country, and appeared on a special TV documentary about jazz in Chile. 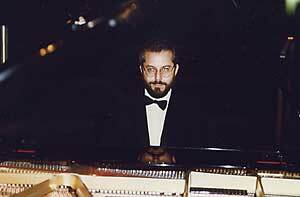 As a youth growing up in New York City, Alan studied both classical and jazz piano intensively. He graduated with honors from the City University of New York, earning a Bachelor of Arts in music. Now residing with his wife and business partner Pamela in the Berkshires, Alan continues to compose, perform, teach, and record. He is a member of the faculty of the Westport School of Music in Connecticut, as well as an Associate Faculty member at the Hotchkiss School in Lakeville, Connecticut. Alan has been awarded a 1995-1996 Individual Artists' Fellowship Grant for music composition by the New York Foundation for the Arts. So listen to the jazz pianist whose playing The New York Times has described as "clean, energetic, and fraught with periodic surprises... Mr. Simon holds it all together, weaving and soloing with sensitivity and taste."